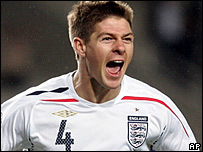 Steven Gerrard spared England and coach Steve McClaren's blushes with a crucial double strike to break Andorra's resistance in the Euro 2008 qualifier. England were jeered off after a shameful first 45 minutes in Barcelona. But Gerrard broke the deadlock with a low 20-yard drive after 53 minutes, then slid home a neat finish with 15 minutes left in an ill-tempered clash. Debutant David Nugent scored in the last minute after Jermain Defoe saw a shot saved by keeper Koldo Alvarez. England, as expected, were without Frank Lampard after he was ruled out with a broken wrist sustained in training. And he may have been grateful for sitting out a shambolic first half that was notable for the persistent abuse aimed in the direction of McClaren and his team by furious England supporters. Andorra's only threat was a physical one, with Wayne Rooney targeted for rough treatment and Owen Hargreaves cynically elbowed by Justo Ruiz. Alvarez did well to repel the few moments when England did threaten, saving well from Andrew Johnson and Gerrard. The busy Johnson also curled an angled drive just over and Stewart Downing was off target twice when he should have done better. England departed at half-time to a crescendo of jeering, but were able to cheer their fans by finally breaking the deadlock after 53 minutes. Rooney touched the ball into Gerrard's path and he made no mistake with a low drive from 20 yards. Rooney then managed to rule himself out of the visit to Estonia in their next qualifier in June when he received a yellow card, along with Oscar Sonejee, as their running battle continued. The Manchester United star was wisely withdrawn on the hour to avoid further trouble and was replaced by Defoe, while Micah Richards was stretchered off injured - with Kieron Dyer going on. Gerrard wrapped up the win for England after 75 minutes, racing on to a clever touch by Defoe to slide a precise finish past Alvarez. And McClaren then gave a debut to Preston's Nugent, the youngster going on for Johnson. He was narrowly off target after good work by Downing, but claimed England's third as Defoe's shot rolled towards the goal-line. Andorra: Alvarez, Sonejee, Lima, Ayala, Bernaus, Escura, Vieira, Genis Garcia, Justo (Fernandez 88), Pujol (Martinez 69), Toscano (Moreno 90). Subs Not Used: Alfonso Sanchez, Somoza, Rubio, Jimenez. Booked: Lima, Toscano, Sonejee, Genis Garcia. England: Robinson, Richards (Dyer 61), Terry, Ferdinand, Cole, Lennon, Hargreaves, Gerrard, Downing, Johnson (Nugent 79), Rooney (Defoe 61). Subs Not Used: Foster, Carragher, Barry, Carrick. Goals: Gerrard 54, 76, Nugent 90. Ref: Bruno Miguel Duarte Paixao (Portugal).